Panasonic launches 2012 LCD and LED TV line-up | What Hi-Fi? 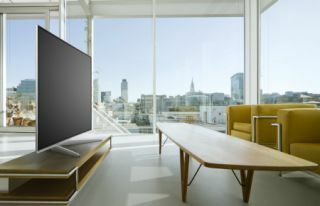 Panasonic has today confirmed its line-up of LCD and LED televisions for the UK at its European Convention in Hamburg. There are screen sizes from 19in to 55in, the company's first passive 3D sets alongside full HD active 3D TVs, IPS LED panels for improved viewing angles, integrated wifi, Viera Connect smart TV content and more. Leading the line is the Viera WT50 LED series, pictured, in 42in (TX-L42WT50) and now 47in (TX-L47WT50) and 55in (TX-L55WT50) screen sizes. They're full HD, 3D, IPS LED panels with Infinite Contrast dual core pro4 processors (which means the web browser supports Flash) and come with two remote controls and two pairs of active 3D glasses. The 200Hz panels offer 1600Hz backlight scanning, Viera Connect with built-in wifi, 2D-to-3D conversion, USB/SD recording, DLNA, Bluetooth and more. The DT50 also focuses on larger screen sizes, with 42in (TX-L42DT50), 47in (TX-L47DT50) and 55in (TX-L55DT50) models. There's no dual core processor, they offer Brilliant Contrast and you'll have to do without the extra remote or free glasses. The ET50 comes in 42in (TX-L42ET50) and 47in (TX-L47ET50) sizes and has a 200Hz panel but only 800Hz backlight scanning, plus Clear Panel with Brilliant Contrast. They're still Viera Connect smart TVs with integrated wifi, active 3D and all the further features. The entry-level Viera 3D LED series is the ET5, which comes in five sizes, and most crucially is Panasonic's first passive 3D range of TVs. Available in five sizes, 32in (TX-L32ET5), 37in (TX-L37ET5), 42in (TX-L42ET5, 47in (TX-L47ET5) and 55in (TX-L55ET5), they come with four pair of glassesand are 100Hz sets with 300Hz backlight scanning, Viera Connect, built-in wifi, 2D-to-3D conversion, DLNA and more. Entry-level Smart Viera LED meanwhile comes in the form of the E5 seris. It's a 50Hz set, with 150Hz backlight scanning and Brilliant Contrast on all but the 32in, which is 100Hz scanning and High Contrast. They still boast Viera Connect, DLNA, four HDMI inputs, two USB connections and have optional wifi. The X5 is the entry-level LED, with a 19in (TX-L19X5), 24in (TX-L24X5) and 32in (TX-L32X5) model. They're HD-Ready models with HDMI and USB inputs. Lastly, the only traditional LCD series is the C series, a 32in (TX-L32C5E) and a 24in (TX-L24C5E). You can also read all about the Panasonic 2012 range of plasma TVs here and check out our Panasonic blogs for pictures and full specs.